Oil and gas companies are seeking to prolong the life of existing fields as falling energy prices and tighter credit markets curb funds to exploit new reserves. Output from Slochteren, set to decline after 2025, is capped to extend the life of the field, which contains about a third of the European Union’s proven gas resources. “That’s why you are talking about 50 years or more and a lot of it will depend on the decline curve and how rapidly you will pull it down,” Tillerson said at an event to mark the 50- year anniversary of Slochteren’s discovery. Exxon operates the field with Royal Dutch Shell Plc, Europe’s biggest oil company, through Nederlandse Aardolie Maatschappij (NAM). Slochteren, which started pumping gas in 1963, yields an average of 40 billion cubic meters (1,400 billion cubic feet) a year, more than half the Netherlands’ production. The field, the largest source of the country’s wealth, has generated more than 160 billion euros ($221 billion) in revenue for the Dutch state, according to Economic Affairs Minister Maria van der Hoeven. The potential of Slochteren is enormous given the amount of untapped unconventional resources such as tight and shale gas and coal-bed methane, Stephen Holditch, head of the Harold Vance Department of Petroleum Engineering at Texas A&M University, said today in an interview in Groningen. Tight gas is gas that’s difficult to access because of the composition of the rock and sand surrounding it. Because extraction is complex, producers require sufficient financial incentive to tap it. A rebound in oil and gas prices and the slowing of production at Slochteren may lead the field’s developers to search for unconventional resources, Holditch said. When producers brought the field on stream, recoverable gas volumes were estimated at 2,700 billion to 2,800 billion cubic meters, of which 1,700 billion cubic meters have been pumped. 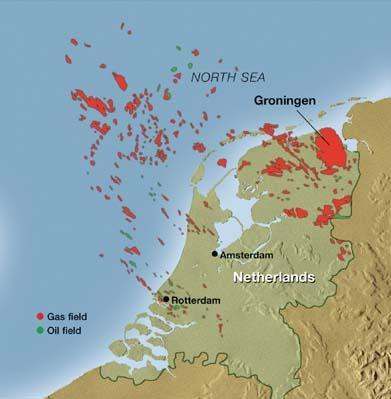 Since the oil crisis in the 1970s, the Dutch government has sought to keep the field in reserve while exploring and developing other deposits. When gas demand exceeds total supply from the other fields, Slochteren makes up the difference. The world has the equivalent of about 320 Slochteren fields in unconventional gas resources that are technically recoverable, Texas University’s Holditch said.